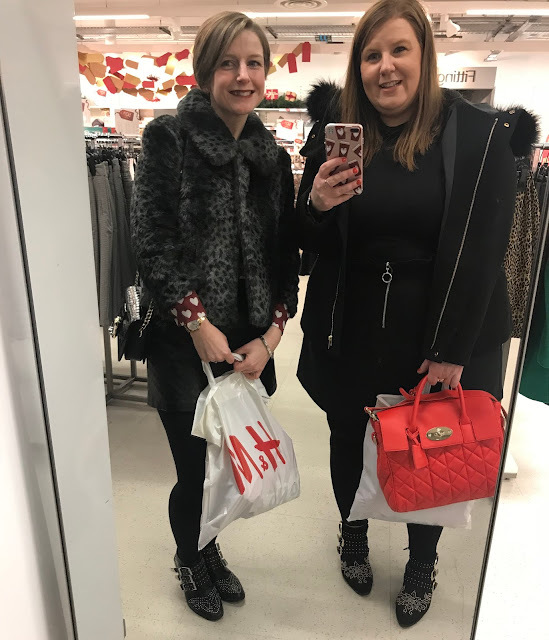 My lovely friend Krissi and I had an amazing shopping challenge this week, when we were tasked with visiting Silverlink Shopping Park for a shopping extravaganza. I've had all of my Christmas shopping done for a while now, so it was really nice to go and look at Christmassy things without having to think about presents! Silverlink Shopping Park is situated near the Coast Road junction on the A19/A1058 at Wallsend, North Tyneside and has some really great highstreet shops such as Marks and Spencer, H'n'M, Next, River Island and New Look to name a few, as well as some great restaurants and an Odeon cinema. I always like the ease of visiting a retail park, as you're only ever a stones-throw away from your car should you need to drop off some heavy bags. We set ourselves the challenge of seeing what we could buy for £30 at Silverlink, but before that, we decided to have a festive afternoon tea-style lunch at M & S. Choosing egg and turkey feast sandwiches, crisps, lemon cake and chocolate orange marble cake, we set up our table and felt like we were having our own festive Christmas tea party; great fuel for shopping and a great way to discuss what we were hoping to spend our money on. Lunch was delicious, and the shopping park's free WiFi meant that we could post our yummy food pictures on the go with ease (you know how it is when you hit 4G black spots when you're trying to post!!). It's so easy to sign up for the WiFi too (here). 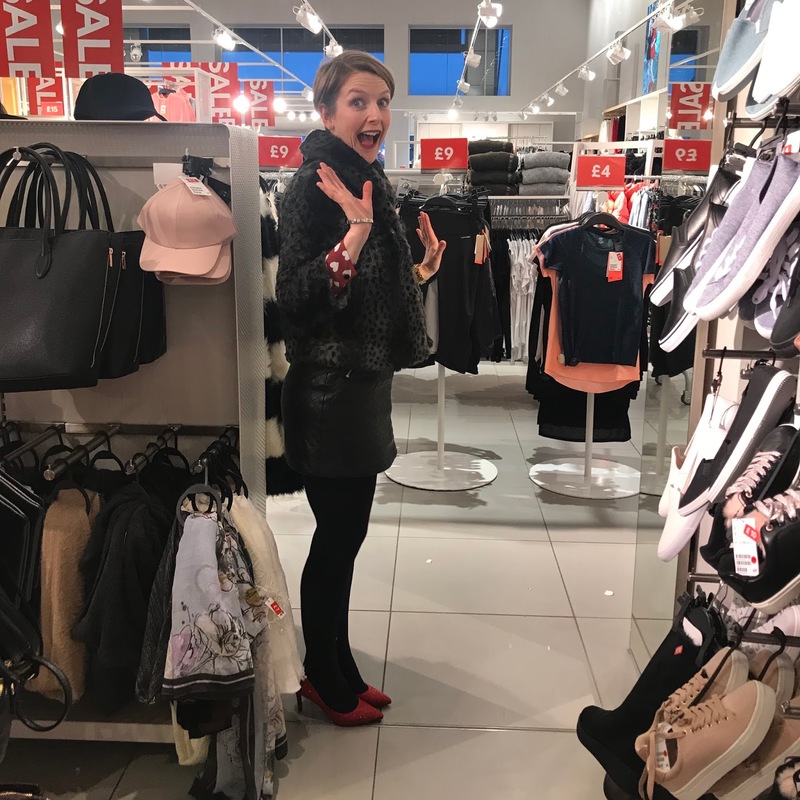 I decided to shop with an open mind, to see if I could pick up some bargains. Starting in H'n'M, I instantly fell in love with this blue jumper (on sale for £12) but sadly it was not to be (too big!). 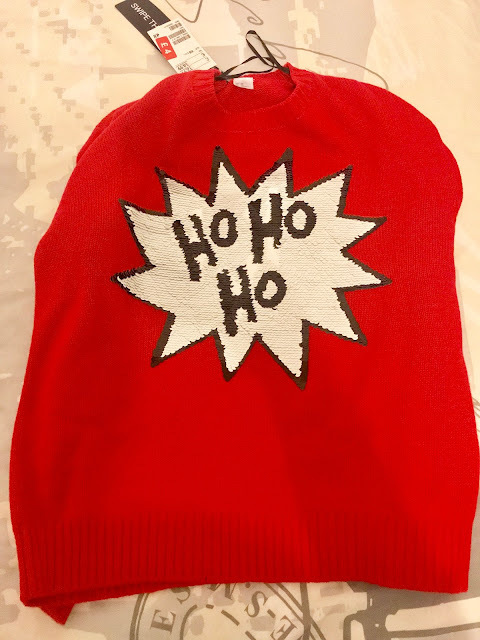 Feeling the festive vibes however, I decided to go for this gorgeous red Christmas jumper instead, which I think will be my pick for Christmas Day (if you swipe the sequins, Ho Ho Ho turns into Yo Yo Yo!). It was an absolute bargain at £4 in the sale. 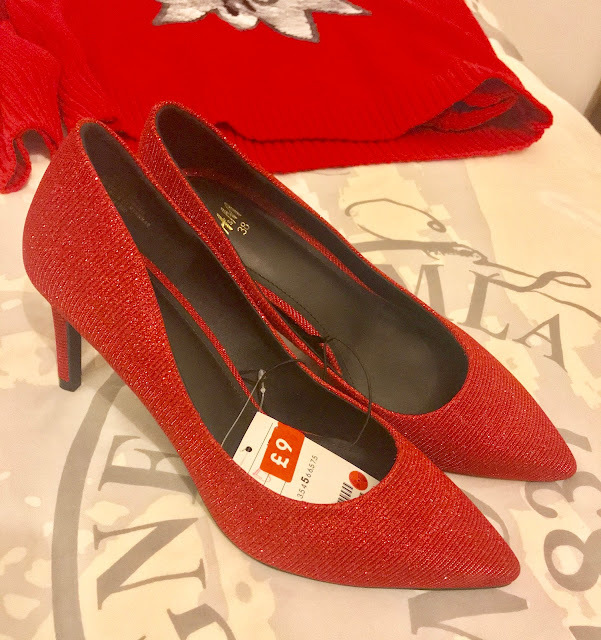 Next, I fell in love with these amazing red heels! They are so comfortable and were an absolute steal at £9 (half price!). I feel like Dorothy from the Wizard of Oz when I wear them, but teamed up with black jeans, I think they'll be great for a smart-casual Christmas Eve outfit. I'd only spent £13, so still had £17 left to play with...it was so much fun seeing what I could get for my spends! 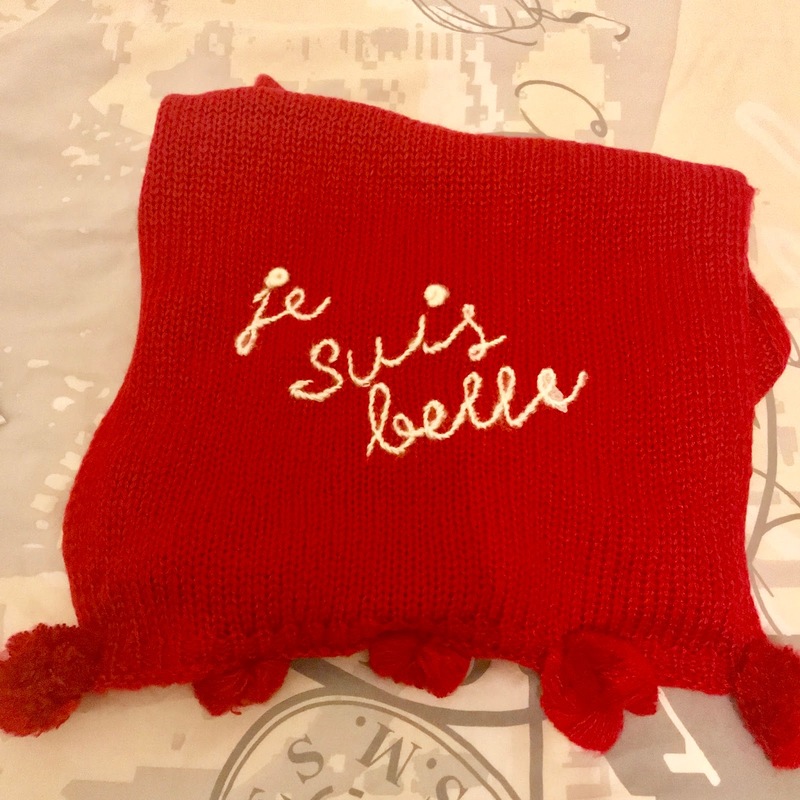 Back to Marks and Spencer, I'd already become smitten with this beautiful red scarf on a previous shopping trip to Metrocentre. Although it was over the remains of my budget at £22.50, I simply couldn't leave it behind, so decided to add £5.50 to my money so I could take it home with me. Total spend was £35.50, not bad for a day's shopping and three amazing purchases! And all red too, I must be feeling festive (don't worry, I won't be wearing them at the same time!!). Thanks Silverlink for having us and thanks Krissi for inviting me to come along to take part in the shopping challenge, it was such a fun day! Find out what Krissi bought here!